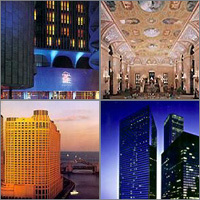 Compare discounts for Hotels in Chicago, Illinois! The Chicago metropolitan area is the third largest metropolitan area in the United States. Almost 3 million people live within the city itself and over 8 million live in the outlining suburbs. But the 'Windy City' is big not only in size but also in features. It is home to Sears Tower, North America's tallest building, the Chicago Board of Trade, one of the biggest options and futures trading floors in the world and Chicago O'Hare International Airport, one of the world's busiest airports, just to name a few. Chicago's downtown area, located on the shores of Lake Michigan, is the most impressive urban environment between Tokyo and New York. It is laid in a grid and can be easily navigated by either foot or the readily available public transportation system. The birthplace of the skyscraper is still considered to be the finest displays of modern architecture in the world. One of the top 10 most visited cities in the US, Chicago is truly a place where there is something for everyone. The availability of art shows, sporting events, music concerts, fine dinning and shopping opportunities rivals that of Paris, London and New York. The outlying suburbs of Chicago are actually medium sized towns and cities by their own right - each has its own character and attractions. From the roaring crowds at Wrigley Field to the roaring roller coasters of Six Flags Great America, from the glitzy shops of the Magnificent Mile to the glittering casinos at Joliet, from the fine art at the Art Institute of Chicago to fine dinning at Chicago's 5 star restaurants - this is truly a great American city. The Hyatt Regency O'Hare is a world-class convention hotel featuring 1,100 luxurious guest rooms. The Hyatt Regency hotel is near O'Hare International Airport and only 20 minutes from downtown Chicago. The Hyatt Lodge at McDonald's Campus is a first class hotel located 16 miles from Chicago O'Hare International Airport. This new hotel is situated on 88 acres on beautifully landscaped forest preserve with guest rooms that offer a view of the forest or the lake. The Hyatt Rosemont is an eight story hotel located adjacent to the American Academy of Orthopedic Surgeons and just minutes from O'Hare International Airport, world class shopping and local attractions. Sofitel Chicago O'Hare is conveniently located near O'Hare International Airport, adjacent to Donald E. Stephens Convention Center, adjoined to the Sofitel by an enclosed skybridge, and steps away from Rosemont Theatre. Belden Stratford Hotel is a renowned Lincoln Park landmark, beautifully refurbished and enhanced with all the accoutrements of luxury living. Adjacent to the American Management Association headquarters and one mile from the Donald E Stephens Convention Center, the Chicago Marriott O'Hare is located fifteen miles northwest of downtown Chicago.